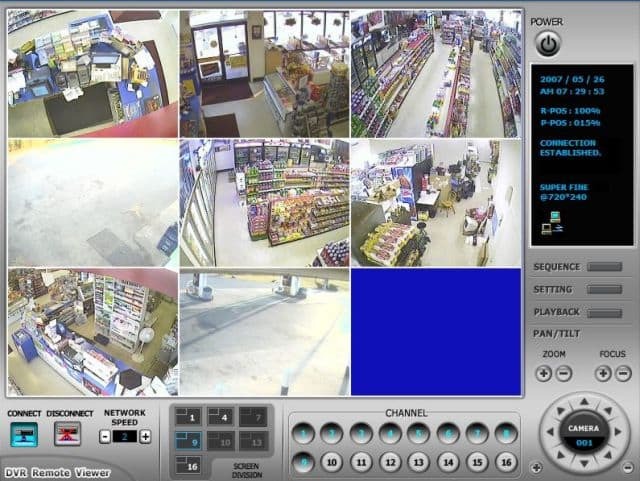 The following surveillance system was installed by one of our installation partners at a gas station and convenience store in North Carolina. This was an 8 camera installation with 6 cameras installed inside of the gas station store and 2 cameras installed on the outside of the building to provide security at the front and back entrances. Our JP 8 channel security system DVR was used. 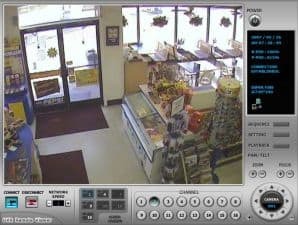 The DVR was setup by the installer for remote Internet viewing so that the store owner could watch his business while at home or traveling. The gas station had a existing DSL connection from Bellsouth that was used to connect the DVR to the Internet. The DSL connection used a Motorola Netopia router and DSL modem and a static IP address. The Netopia router supports the concept of port forwarding, but refers to it as “pinholes”. The router was confiured to forward all requests on port XXXX (excluded for security) to the DVR. CCTV Camera Pros JP surveillance DVRs come with a CD that contains the remote viewing software needed to view the cameras online. The DVR viewer software can also be downloaded from our website here, and can be installed on any Windows based computer. Below are pictures taken from live screenshots of this installation that show what Internet viewing looks like using the DVR viewer software that comes with our JP DVRs. Here are the 1 Camera, 4 Camera, and 8 Camera views that are available through the viewer with an 8 channel DVR. A 16 Camera view is available when using the 16 channel DVR. 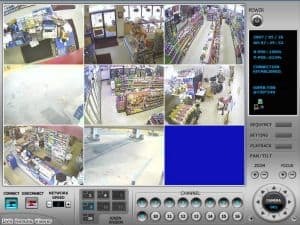 In addition to providing remote viewing capabilities, the DVR viewer also allows an operator to control other functions of the DVR remotely such as playback from hard drive, event searching, and remote backups. By clicking on the 1 channel screen mode button, then selecting the camera/channel that you want to view, the operator of the DVR viewer can switch to view any security camera within the system. Below are the 1 channel views of all the cameras that were installed at this gas station. 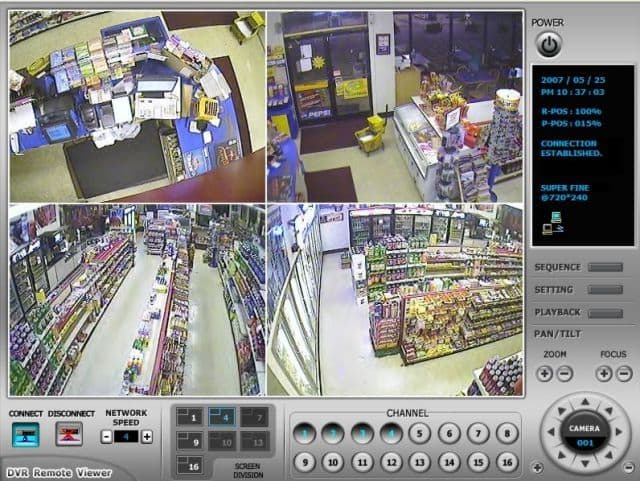 Cameras were positioned at the store backroom, cash register front view, cash register overhead, exterior front entrance, interior front door entrance, exterior back entrance, and 2 store isle views. The installer told us that 3 theives were caught shoplifting in the store within the first 2 weeks of the surveillance system being installed. We love to hear success stories like this at CCTV Camera Pros.